Frontwoman Alexis Krauss talks about music in the age of Trump and fleeing the city to find her greatest inspiration. Alexis Krauss positively loves talking tech. With Derek Miller, her studio-savvy partner in the industrial-strength pop duo Sleigh Bells, the singer carefully constructs whirring, clanking, guitar-squealing backdrops that frame her conversely angelic, Ronettes-retro voice, as on the pair’s painfully beautiful new seven-song mini-LP, Kid Kruschev. What’s unexpected, however, is the type of technology she wants to discuss on a fall afternoon. Krauss has become an avid rock climber, as well as a registered camping and hiking guide, which helps explain a recent move from her native Brooklyn to a wilderness retreat in upstate New York, where Kid Kruschev was conceived and partially recorded. Her pastime is now her passion. “Some of this is going to sound so silly, because it is so technical,” Krauss apologizes, before explaining the sport of climbing for the ground-hugging layman. When you’re tackling a mountain, pitons (the metal spikes that climbers drive into the rock wall) are no longer popular, she says. In her ascents, she relies on both passive and aggressive forms of protection, like camalots, no hammering required. In the local area she prefers to scale, the Gunks (short for the Shawangunk Ridge), she regularly passes piton relics, still jutting from the rocks, some over 70 years old. It’s difficult to picture Krauss in nature-girl mode. 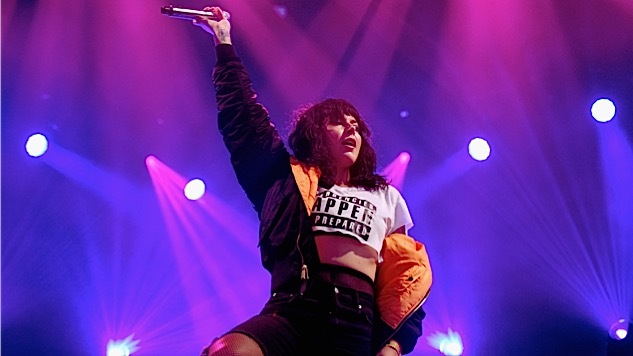 In Sleigh Bells, she’s cultivated a bomber-jacketed, cutoffs-and-Keds, kohl-eyed stage persona that’s somewhere between Elvira and Tura Satana’s immortal take-no-guff biker chick Varla from Russ Meyer’s Faster, Pussycat! Kill! Kill! That aesthetic has perfectly complemented the band’s brutal sonic attack, starting with their 2010 debut, Treats. So the transformation isn’t that far-fetched insists Krauss, who, as an offshoot of the boxing she and Miller began doing in a New York gym to relieve the pent-up aggression heard on Sleigh Bells’ sinister sophomore set, 2012’s Reign of Terror, switched to rock-climbing at a newly opened city facility. When she realized she could afford to purchase her own place in the upstate woods, where she already spent much of her spare time bouldering, she pounced, moving in to her rustic digs with her mother, her significant other Tyler, and her dog Rizla (whose throaty barks Miller actually converted to percussion on 2013’s Bitter Rivals). Then she began bringing Miller up from New York City to write and record. And he, too, was transformed—although it took some convincing at first. 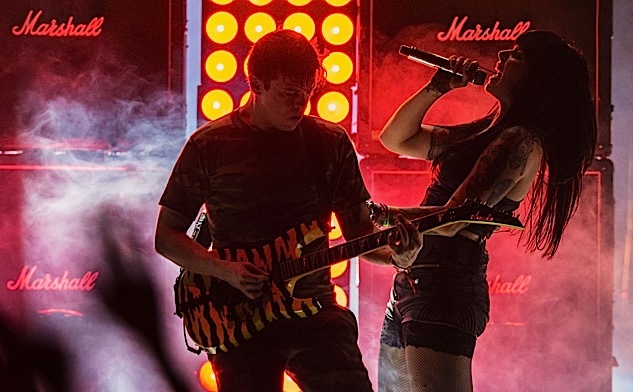 Part of Sleigh Bells’ allure is the dark, often tortured lyrical imagery that Miller conceives for his partner to sweetly trill in that apartment, locked away and left to his own self-flagellating devices. What kind of sepulchral sonnets could he summon, surrounded by foxes, chipmunks, bobcats, raccoons and a noisy flock of wild turkeys? Influenced by the grim Trump era, he managed to descend to still murkier levels on Kid Kruschev, which was a fun alliteration he liked and also a name under which he’d once considered making music. The most obvious reference: The thumping “Show Me the Door,” which opens with Krauss chirruping in tandem with a Transformer-vocodered murmur (“Check it out, check it out, the faith’s going away”) and slithers toward an ominous yet optimistic, “You made it this far/ Just a little bit more / Before we show the door.” It’s fairly obvious who’s getting ushered toward the exit.